For security reasons, RockMongo is accessible only when using 127.0.0.1 as the hostname. To access it from a remote system, you must create an SSH tunnel that routes requests to the Apache Web server from 127.0.0.1. This implies that you must be able to connect to your server over SSH in order to access these applications remotely. IMPORTANT: Before following the steps below, ensure that your Apache and MongoDB servers are running. In order to access RockMongo via SSH tunnel you need an SSH client. In the instructions below we have selected PuTTY, a free SSH client for Windows and UNIX platforms. The first step is having PuTTY configured. Learn how to connect to the server through SSH using an SSH client on Windows. Click the “Add” button to add the secure tunnel configuration to the session. (You’ll see the added port in the list of “Forwarded ports”). 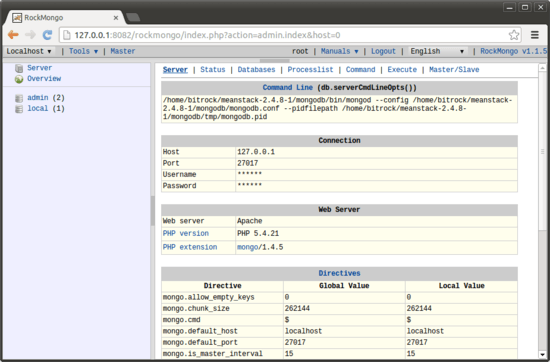 Access the RockMongo console through the secure SSH tunnel you created, by browsing to http://127.0.0.1:8888/rockmongo.